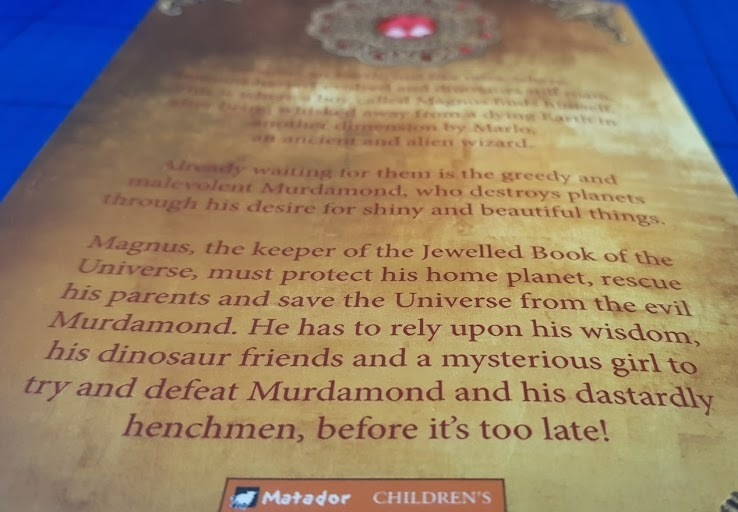 Magnus And The Jewelled Book Of The Universe is the first young fiction novel written by S.L Browne, released by Matador Children's Books last November. It is a book with the message to look after our planet, woven into a tale of mystery and intrigue, dinosaurs and tornadoes and an 8 year old boy named Magnus. As the book starts Magnus and his elderly guardians move swiftly from mundane life to something completely different. A tornado approaches and a Police Officer visits their house to ensure they evacuate. There is a plan for Magnus and he is not only evacuated, he's removed completely to an entirely new world, an alternate Earth. There are no humans as we know it on the new Earth, but there are many characters living out their lives in a very similar way. They have gardens and vegetable soup, and also boredom, which has allowed a character called Murdamond to introduce greed, covetousness and money. They want pretty things and begin to forget what has always been important, in order to gain for the moment. Murdamond realises the potential this Earth has and creates a mine and a factory. He encourages the population to send their young down the mine, or to work at the factory, purely so that they can have more 'pretty things'. Murdamond is the big bad guy in this tale. He has already worked his evil plan on many Earths during his lifetime, spreading capitalism, controlling financial systems and media and convincing the people that this is what they want - their idea. He takes everything of value from the ground and the people. Once each planet is fully exploited and dying, he moves on. One of the big signs that it's beyond hope is the death of the bees. As the story progresses Magnus knows he has to help rescue the parents he doesn't remember and restore some order to his new world. He may not be the human as he'd always assumed, but he is a really special boy with amazing gifts (including always being safe from harm by animals) and The Jewelled Book Of The Universe takes an instant liking to him. 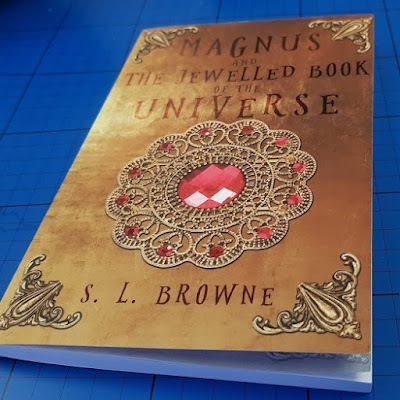 The Jewelled Book Of The Universe (with a cover that contains every jewel found in the entire universe) is an amazing book and you could well say it has a mind of it's own, as it decides to transform in the most incredible way towards the middle of the story. It takes on a human form and calmly and silently, without explanation, joins Magnus and his guardian. This is an excellent book and it was hard to put it down at times, even for me without the children there. The imagery is brilliant, very clear and sets an amazing scene without being overly wordy. 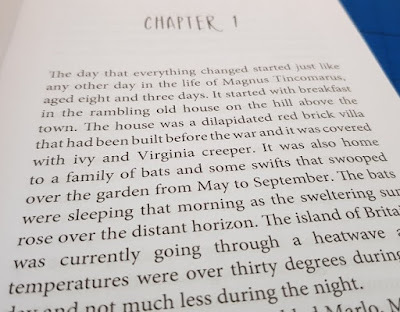 The hardest part of the entire book to read is the first 4 pages, as 3 characters are introduced rapidly and 2 of them have similar and unusual names, so it's confusing until you separate those, but that would be my only gripe. It's an excellent story and unique. S.L.Browne really deserves to go far. Despite having no illustrations through the book, at 91 pages this is not too long for younger readers 7+, who might not be incredibly confident yet with chapter books. The main character is just over 8 years old and very easy to identify with. The storyline covers some quite complex topics and is a deeper read than a lot of young fiction, but it isn't told in a condescending way, more woven into the story for children to understand implicitly. It's so clear, as you read the book, you are constantly reminded that we are doing it wrong. A great read for boys and girls aged around 7-8+ and I've enjoyed it immensely too - I'm just a little older. A fantastic story and the first book in a trilogy - we'll definitely be reading the next two. Magnus And The Jewelled Book Of The Universe is written by S.L.Browne and published by Matador Publishing. The book includes a preview of Book 2 and has 113 pages in total. Available to buy now in paperback rrp £6.99 from all good book shops instore and online, including Amazon (*aff).